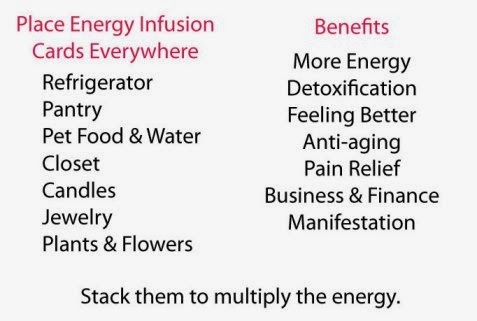 These energy infusion cards infuse energy into your body in several ways to help clear old traumatic memories, increase your energy levels and detoxify the system naturally to create a healthier mind and body. The cards help to detoxify the organs and glands as well as toxins from the brain and pineal gland. Clearing of old memories is possible, especially when you use as much of the energy as possible. Using the cards takes longer to clear old memories than using the Emotional Freedom service I offer which only takes 15 - 30 minutes or so. The more you infuse everything around you with the energy the better you will feel and the more benefits you will attain. Charge everything you eat, drink and wear to add large amounts of energy to your body so that everything you come into contact with will feed you even more energy. Print out as many as needed. Laminate the cards if needed but especially in areas where they may get wet like in the refrigerator or bathroom. Water - adding the energy to your water makes water taste fresher and smoother. It changes the molecules of the water so that they are better absorbed by the cells of your body thus hydrating you much more efficiently. When you hydrate the body in this way your stomach feels fuller satisfying hunger for weight loss. Test #1: As a test try placing a card under a glass of tap water and fill another glass with tap water as a control. After letting them both sit for a while the energized water should taste cleaner. It's best to drink filtered water whenever possible so I don't recommend drinking lots of tap water. This experiment is just to test the change in taste. The energy in the water changes the clusters of the water molecules. Food - place the cards in your refrigerator, freezer and pantry. The food will absorb more energy the longer it sits. Food energized in this way helps to neutralize toxins before ingesting them, it cleans out the digestive system and aids the body's ability to absorb and digest food which promotes weight loss. It also helps the body to feel fuller sooner reducing the amount of food eaten. Perishable food lasts much longer than food that is not energized. Place a card underneath fruit for better taste and any other food that usually only lasts a short time and lengthen the time of its freshness. Sleep on the cards - place the cards face up on the floor under your bed or between the mattress and box spring and under the area where you sleep. Use as many cards as you like starting with 1 or 2 cards and add more over time, as much as you can bare. The energy will go up through the mattress and into your body. Test #2: Place a few of the cards underneath you and lay down on top of them. If you use 10 cards stacked on top of each other you will feel a strong amount of energy build up on and in the area of skin directly above the cards. You can try this test just by holding the cards face down on your skin. It will become uncomfortable the longer you hold it. Vitamins, Minerals and other Health Supplements - energized supplements are much more effective. Clothing - put the cards in your closets and drawers so that when you wear the clothes the energy absorbs right into the skin. Jewelry holds the charge easily so energize all of your jewelry for an extra energy boost. Rooms and areas - place cards in any area so that you can absorb the energy. Placing the cards in work areas, under computer keyboards, monitors and laptops boosts productivity. It also clears negative or stagnant energies from the area. Pain - place the card directly on the spot where you feel pain for pain relief. Or charge your lotions or oils and massage it into the area to relieve pain. Pets love the energy. Either energize your pets water and food before you give it to them or place a card under their water and food bowls and watch how much more lively they become. Plants and Flowers - cut flowers last longer and potted plants flourish, and even come back to life, when you place a card underneath flowerpots or even in garden soil (laminated to keep out moisture) for healthier, faster growing, energy infused fruits and vegetables. Manifestation - send energy into vision boards by placing a card underneath the board or on top facing the board. Write your name somewhere on your vision board so that the energy is sent towards your goals for your benefit. Business - give a boost to your business by placing your business card faced-down on top of an energy card to increase sales and growth of your business. Household Cleansers - Try to use green products when you can and charge any household cleaning items so that they work better. Candles - charge your candles for a while before you light them and when lit they will disperse the energy into the air. Daily exposure to the energy has cumulative effects and you will feel more energized as time goes by. The more you absorb and are exposed to the energy the more toxins will be purged from your cells and the better you will feel. Your cells will begin to revert back to a more youthful state because the energy has an anti-aging effect. The energy comes off the cards face up -- on the front with the words and image showing. Always place the cards facing the direction you want the energy to go towards. For example, faced up with your water on top, faced down on top of your water. 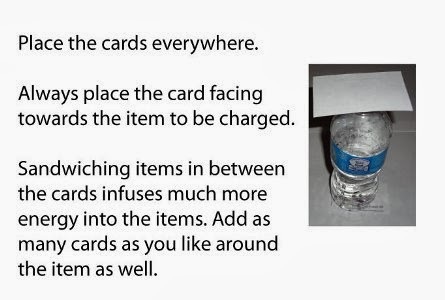 Placing a card into any container infuses the contents with the energy. Use more cards for even more energy. You will be able to print as many cards as you like and they will work as long as you are a subscriber. Every card you add will double the strength of the energy that comes off of the paper. How long to let the card sit? 30 minutes should be long enough for a small bottle of water. For larger bottles of water and most other items you can let it sit for an hour or so. Leave the cards in other areas and don't remove them for better infusion into the items. If you're sensitive to energy like I am you may find that drinking the water makes you feel a little tipsy as if you're intoxicated for a short time. When this happens it means that the energy is being infused into the body so much so that it causes a sort of overload. If this happens it may be a sign that it is just too much energy at this time and you can take away some cards so that this does not continue to happen. Why is the card Infusion 4.0 and what happened to versions 1.0 to 3.0? The old cards are less powerful than version 4.0 but I plan to make them available soon to anyone who purchases Infusion 4.0. Make sure to sign up by email to the newsletter so you can hear about any updates to this project. Even more information is coming soon. 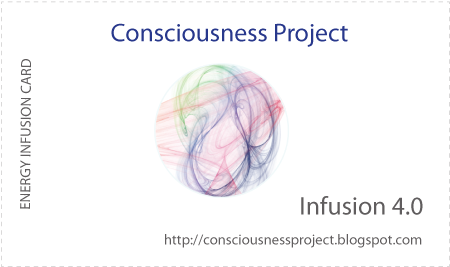 Purchase either of the radionics machine subscriptions and get the Infusion Cards for free. Choose from the Healing Paper Radionics Machine (but only if you spend $15) or the Manifestation Paper Radionics Machine.